Patients with nonepileptic seizures present in neurology, psychiatry, psychology and emergency departments. Although the disorder has been well documented in the medical literature and much is known about the nature and signs of the condition, much less has been written about its treatment and management. 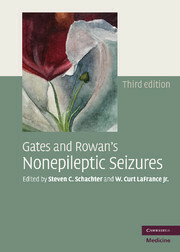 Gates and Rowan's Nonepileptic Seizures, 3rd edition, takes a multidisciplinary approach to this neuropsychiatric disorder, building and branching from the prior editions, with a strong focus on management, to aid all clinicians in the diagnosis and treatment of both child and adult patients. With a DVD containing video material to supplement the differential diagnosis, patient characteristics and treatment sections, and with contributions from the leading authorities from around the world, this will be essential reading for physicians and psychologists, at all levels of training and experience, encountering patients with this complex brain-behavior disorder. Foreword; Part I. Recognition, Diagnosis, and Impact: 1. Epidemiology and classification of nonepileptic seizures; 2. Psychogenic nonepileptic seizures: historical overview; 3. The burden of psychogenic nonepileptic seizures (PNES) in context: PNES and medically unexplained symptoms; 4. Clinical features and the role of video-EEG monitoring; 5. Co-morbidity of epileptic and psychogenic nonepileptic seizures: diagnostic considerations; 6. Nonepileptic paroxysmal neurologic and cardiac events; 7. Parasomnias: epileptic/nonepileptic parasomnia interface; 8. The use of hypnosis and linguistic analysis to discriminate between patients with psychogenic nonepileptic seizures and patients with epilepsy; 9. Diagnostic issues in children; 10. Diagnostic issues in the elderly; Part II. Culture, Cognition and Personality Clusters: 11. Cultural aspects of psychogenic nonepileptic seizures; 12. Psychogenic nonepileptic seizures: why women? ; 13. Use of neuropsychological and personality testing to identify adults with psychogenic nonepileptic seizures; 14. Cognitive complaints and their relationship to neuropsychological function in adults with psychogenic nonepileptic seizures; 15. Health related quality of life: utility and limitation in patients with psychogenic nonepileptic seizures; 16. Legal medicine considerations related to nonepileptic seizures; Part III. Psychiatric and neuropsychological Considerations in Children and Adolescents: 17. Psychiatric features and management of children with psychogenic nonepileptic seizures; 18. Neuropsychological and psychological aspects of children presenting with psychogenic nonepileptic seizures; 19. Adolescents' and parents' perceptions of psychogenic nonepileptic seizures; 20. Munchausen Syndrome; Part IV. Psychiatric Considerations in Adults: 21. Classification of nonepileptic seizures; 22. Post-traumatic stress disorder, abuse and trauma: relationships to psychogenic nonepileptic seizures; 23. Comorbidities in psychogenic nonepileptic seizures: mood, anxiety and personality disorders; Part V. Treatment Considerations: 24. Historical approaches to treatments for psychogenic nonepileptic seizures; 25. Managing psychogenic nonepileptic seizures in patients with epilepsy; 26. Models of care: the roles of nurses and social workers in the diagnosis and management of patients with psychogenic nonepileptic seizures; 27. Who should treat psychogenic nonepileptic seizures? ; 28. Designing treatment plans based on etiology of psychogenic nonepileptic seizures; 29. Cognitive behavioral treatments; 30. Group psychotherapy treatment for psychogenic nonepileptic seizures; 31. Hypnosis in the treatment of psychogenic nonepileptic seizures; 32. Pharmacological treatments for psychogenic nonepileptic seizures; 33. Family therapy for patients diagnosed with psychogenic nonepileptic seizures; Appendix; Index.